We are developing technologies for autonomous mapping and exploration in urban environments, using a Segway RMP with scanning laser range-finders mounted in the vertical and horizontal planes. Some early results can be found below. Map of the Gerentology building. For those with a VRML viewer, download the interactive model from here (beware: it's big, and may crash your browser). Map of the USC University Park Campus. 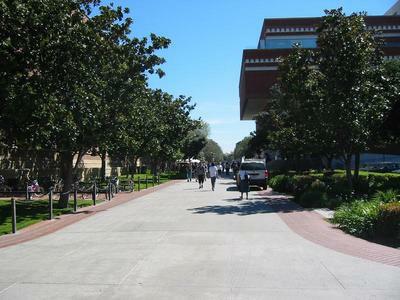 Map detail from the USC University Park Campus, note the row of trees (left) and the steps leading up to the USC Bookstore (right); the ground plane has been deleted from this image. 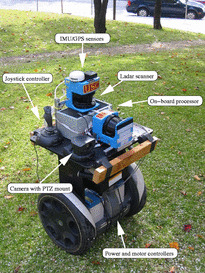 This work is sponsored in part by DARPA grants DABT63-99-1-0015 and 5-39509-A (via UPenn) under the Mobile Autonomous Robot Software (MARS) program.